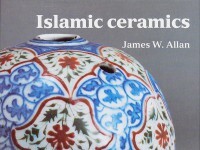 Book painting, both illumination and illustration, had a marked impact on the decorative ceramic tradition of the Islamic Near East in the twelfth and thirteenth centuries. The underglaze-painting technique (see no. 10 [EA1978.2311]) had one serious limitation – colour: it was confined to blue and black. In northern Iran, probably in Kashan, was developed the technique of overglaze painting, painting onto the cold glaze with enamel colours which were then fixed in a final, low temperature firing. This enabled the potters to copy and develop the more highly-coloured, artistic ideas already in use among book painters. Objects decorated in the overglaze technique are normally called Minai-ware, from the Arabic word mina, ‘glaze’. On the upper bowl [EAX.3102] the blue is under the glaze, the gold and red over it. 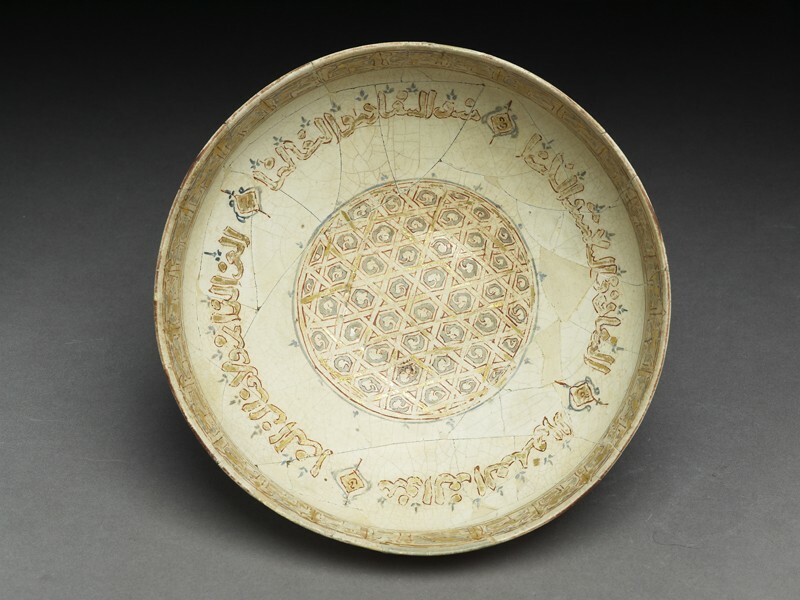 The central geometric design is probably inspired by a Quranic frontispiece, while the gilded letters, their red outlines, and the four ornamental dividers can also be compared to the calligraphy and illumination of luxuriant Quranic manuscripts. The words on the inside of the rim, in kufic geometric script, are purely ornamental. Those in cursive script on the inside of the body, on the other hand, wish the owner good fortune, using such sentiments as eternal glory, increasing prosperity, happiness, peace, generosity and perpetuity! In contrast, the two figures on the lower bowl [EA1956.36] most probably derive from textile designs, in which symmetrical compositions have great technical, and therefore economic, advantages. Moreover, paired horsemen or paired, confronted animals and birds, are common on surviving, early Islamic silks. ‘Minai’ ware was thus drawing not only on illuminated manuscripts, but also on contemporary luxury textiles. The two figures are probably not part of any specific story or legend. More likely they are to be seen as symbols of the ease and well-being that accompany the courtly life. Their symbolic message is then enhanced by the words of good fortune - peace, well-being, joy, happiness and so on, on the inside of the rim.